I haven't heard of a Nevada Magic's before. Any more details? I'm assuming they're setup to run multiple PCB's and were in casino game rooms? Those wall-mounts look very cool! Nickel slots? That is AWESOME, when your kids get tired of wacking those moles and maybe thirsty and looking for something to drink, they can get the urge to drink your budwiser! I belive they were made by Italian G.N.E. Videoiochi at one time or another - if you look at their Magnum cabinet ( http://www.gnevideogiochi.it/corpo.asp?L=0&C=0&R=1&M=89&S=67&Redirect=/corpo/oggetto.asp ) it's almost the same. No, they take Swedish 5-krona, I'm not sure the coin acceptors are working though. Both these cabinets are in a yet-to-start-project status. If you're a Corona fan, I know that they sell six-packs of the small glass bottles. What's the point of 7oz of corona? Isn't that like a dixie cup of water? Chick dig 'em, and where there are chicks who dig beer, there is fun to be had! Eh, I am never prepared to argue with the "chicks dig it" concept... but damn, man, if you want it for the chicks, go with JD cordials so they will at least get drunk in the process. No one gets drunk on half a Corona. I want to build my own llama! But what about 20 halves, eh? Friends don't let friends buy iROMs. When was the last time you saw a chick down 20 beers? Now when was the last time you saw a chick down 20 beers that didn't look like Drew? Could have done without the whole "chicks who look like Drew" mental image. Sometimes practicality must be heeded, especially when we're talking hammered women who look like Drew. 20. mini fridge to keep the drinks close and cold. well that is the list as of today. i am sure it will change again within the next few weeks. ... and that's it for now. 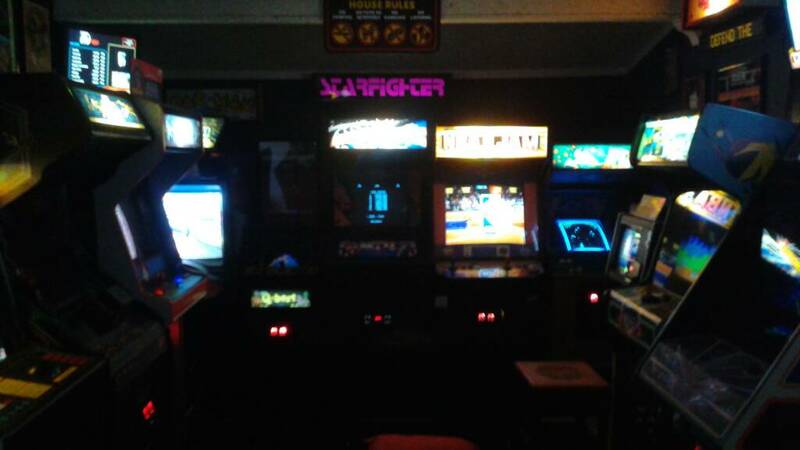 Here are my game rooms. 412 in 1 and a 621 in 1 multicades. Bally Hi Deal pinball machine I have had for over 35 years. PGA Golf Challenge with additional hard drives to play PGA Golf Team Challenge All Access Pass and PGA Golf Team Challenge with online game play. Not mentioned are my Sega Dreamcast Bartop nor my Vertical MAME bartop, cause they arent in my game room. 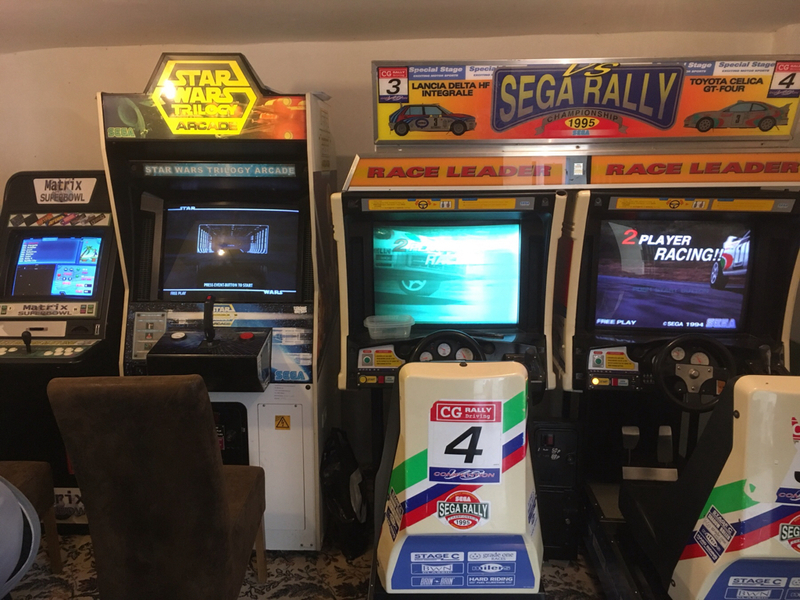 That Namco Cab to the right of MKII is GONE! I am starting to run out of room in the game room. I am starting to build dedicated mini cabs (uprights shrunk by 20%).....but the current collection is below. Dufferin pool table, 2 player mame cabinet.... Dart board. In the garage lethal enforcers 2. Damn ime so Jealous of you guys that have room for all these cabs!! Pandora's Box 3 attached to an X-Arcade and a wall TV. Not much churn here, if any. Work keeps me too busy to fool with this stuff much lately. Lately apparently equals 4 years. casa de yotsuya is awesome...I seen it myself! Next time you guys come over, I'm going to have you guys sign something. I am kicking myself because I had Gamefixer from KLOV in my actual game room, and I didn't even take a picture. Too lazy to type out everything. Games sprinkled throughout house, video below. WOW, just logged in after a 3 year "vacation" from arcade games and boy i was surprised to see this post i started back in 2005 was still being responded to thru 2016. Prettty neat. What even more amazing is in my first post i mention having a dk project. 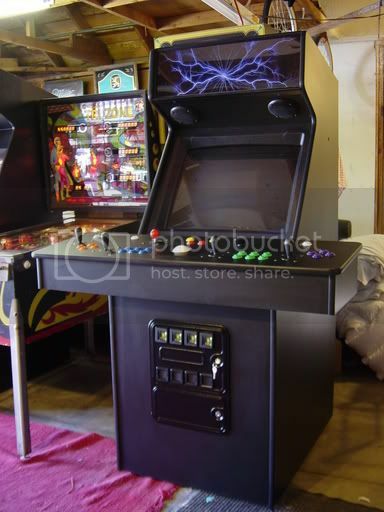 After countless games ive had since then, at least 10 other dk's, i still have that same dk machine. Anyway here is my lineup now. 5. Pga golf cab soon to be my mame cabinet. 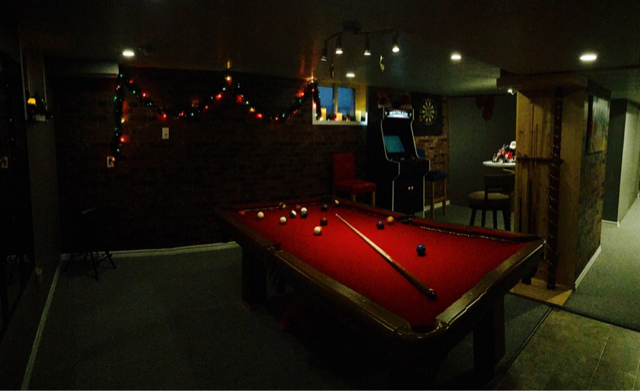 wish i had a gameroom. Nintendo Popeye with a Pandora's Box 3 and 24" LCD monitor. Nintendo Mario Bros (non wide body) with a 21" CRT, MAME & MALA set up. yet finished all the emulator configuration. audio system via a Bluetooth transmitter. I'm quite happy with the jukebox set up. I've got a Bad Dudes and a Final Fight in the garage yet to make it into the house. Lastly a Nintendo style bartop cabinet that has been FOREVER a work in progress. It's going to Punch-Out themed and feature a Raspberry Pi 3 for the internals. Over and above the cabinets I have some custom artwork by a local graffiti artist. mini Sega Genesis USB hub. I'll post some pics later today.